The first annual NATIONAL ALL STAR CHEER & DANCE DAY (NASCDD) took place on September 12, 2015 and united programs across the country in a celebration of All Star Cheer and Dance! Check out the fun in gyms and studios across the country at this year's NASCDD in the tagboard below! Save the date for September 14, 2019 to host your very own National All Star Cheer & Dance Day at your location! 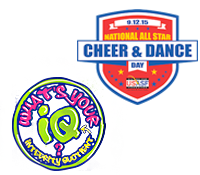 Custom music produced for National All Star Cheer & Dance Day by CheerSounds.